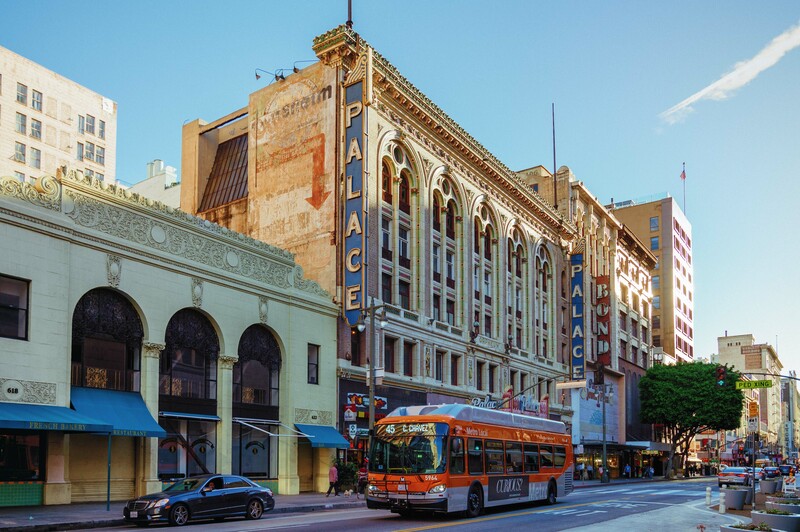 ART OF TRANSIT: Broadway in DTLA on a recent afternoon. Photo by Steve Hymon/Metro. The building on 1st Street between Alameda and Central in DTLA that most recently was Senor Fish is being demolished to make way for the new Little Tokyo underground rail station that is part of the Regional Connector. The building was previously the Atomic Cafe in the 1970s and ’80s and hosted a variety of musicians crossing several genres from punk to jazz. Metro is saving bricks from the building to be used in the new station. The cafe pre-dates my arrival in L.A. but sounds like one of those places that turned up on the Foo Fighters excellent Sonic Highways series on HBO — although the episode on L.A. has inspired some debate about what was left out. The London Mayor says the city will build a $62-million protected bike highway that will link east and west London. The original plans have been scaled back to reduce delays for cars. Check out some of the renderings — this doesn’t look like any ordinary bike lane. As many readers know, London officials have been trying to reduce traffic in the central city by a variety of means including congestion pricing. Tim Phillips, the president of Americans for Prosperity, argues that 1) an increase of the federal gas tax would hit low-income and middle class residents the hardest, and; 2) the best way to preserve the Highway Trust Fund is to eliminate non-highway spending (i.e. transit). My three cents: I’ll leave it to the politicians to decide whether to raise the federal gas tax. But getting rid of the federal investment in transit seems to me a good way to ensure that many Americans — including low-income riders — lose mobility options and have to drive more and, thus, must pay more gas taxes. In other words, no federal investment in transit = hidden tax on many Americans! Quickie background: the federal Highway Trust Fund has been heading for insolvency for a while now, due to cars getting better mileage, Americans driving a tad less and the federal gas tax not being raised since 1993. As a result, some pols are discussing raising the tax, a controversial proposition. On the subject of transit etiquette, watch this video. The Government used to complain that cars were not fuel efficient. Now that they are they complain that we do not spend enough money on gas for the gasoline tax. I think the irony is that this guy doesn’t understand that removing federal spending on highway actually hurts the low income people the most. There is a good reason why they are called transit dependent, its because they can’t afford a car and the obligations that come with ownership. Pro? Less dependency on foreign oil, cleaner air. Con? Less gas taxes collected for highway funding. Quid pro quo. I say we just ditch the entire gas tax idea and just taxing it per miles driven.